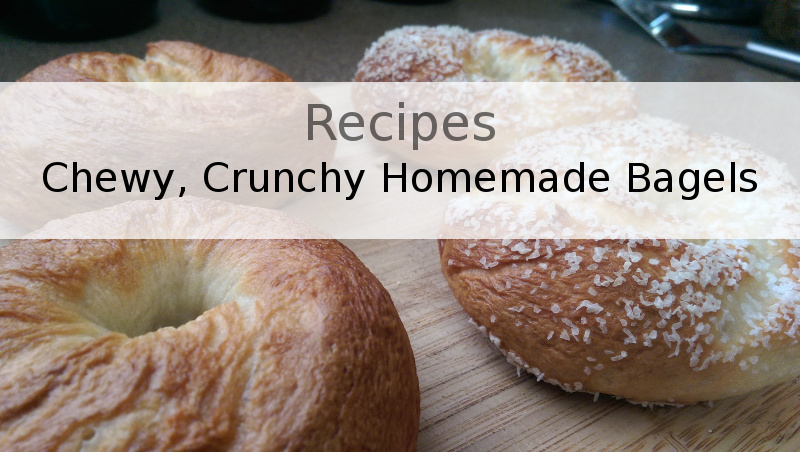 Chewy, Crunchy Homemade Bagels – Food. Beer. Stuff. Once upon a time, I spent my days laboring at a local bagel spot, it was here that I learned to love all things bagel. From the simple bagel with cream cheese to bagel pizzas to my daily addiction of various bagel sandwiches I just couldn’t get enough. As life often goes, I moved on from the bagel store but I never lost my enthusiasm for great tasting, authentic, amazingly tasty bagels. It was with this enthusiasm that I began trying to recreate the perfect bagel in my own kitchen. The bagel recipe I will be sharing with you today is the result of years of trial and error and hundreds of homemade bagels. I don’t like to toot my own horn but I have found these bagels to be better than any I can buy in my area. Unless your lucky enough to live near a company that is still making bagels in the authentic, traditional way I am willing to bet you will agree. Authentic bagels consist of 6 basic ingredients flour, salt, malt, sugar, water and yeast. If you come across any recipes calling for vegetable oil, butter, eggs or other various adjuncts you may want to think twice before spending the time on them as you may not get that familiar taste. I have nothing against those recipes and I’m sure they all have their merits but for me, I take my bagels very seriously and I have found in this instance that keeping true to tradition gives the best results. So with my lecture on tradition complete lets start making some bagels. 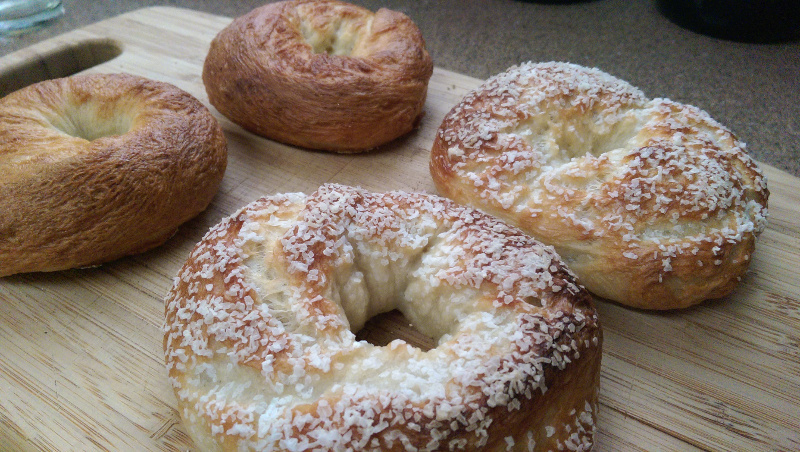 Authentic bagels are not hard to make but it does require some foresight. For the dough to be just right, I will usually start it off at least 18-24 hours before I plan on eating them. The process can be sped up but at the expense of the final taste. So the first thing we will need is a couple of days notice so that the dough can evolve and build flavor. So measure out 3 cups of bread flour and pour into your large mixing bowl. Add in your sugar and salt. Mix the dry ingredients well so that they are evenly distributed then add in your yeast and give the dry ingredients another mix. 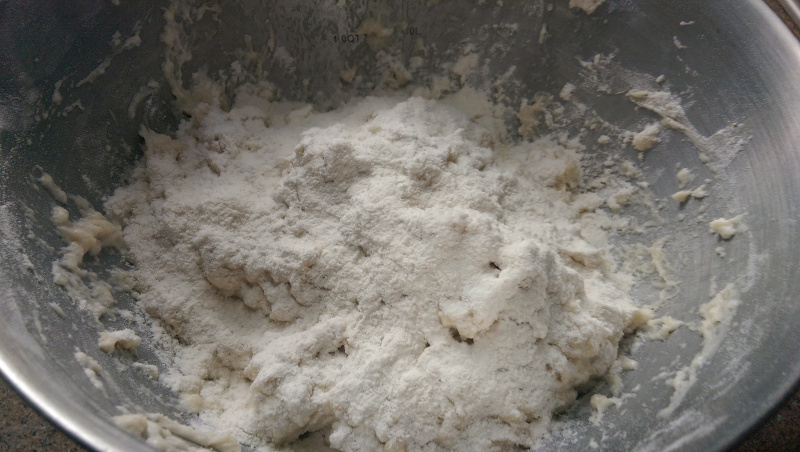 It is important to mix the ingredients before adding the dry yeast or the salt could retard the yeasts development. With your dry ingredients mixed, measure out your 1 3/4 cups of warm water (120F – 130F) and add in your 2 tablespoons of malt syrup. 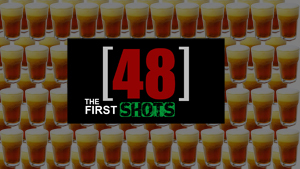 Mix and pour on top of your dry ingredients in one shot. Just pour right on top. With all the ingredients now together, gently stir them into a scratchy wet sticky dough. Don’t worry about it too much, just mix until you can’t see anymore water. 10 or 15 seconds should do nicely. This pile of slop will turn into wonderfully delicious bagel dough. You will be left with the unattractive sticky mess you see above. Shake a little bit of flour on top (just some extra food for the yeast also I feel it helps the dough not dry out on top) then cover with plastic wrap and set it aside somewhere at room temperature to rise. Just sprinkle some flour on top. No big whoop. 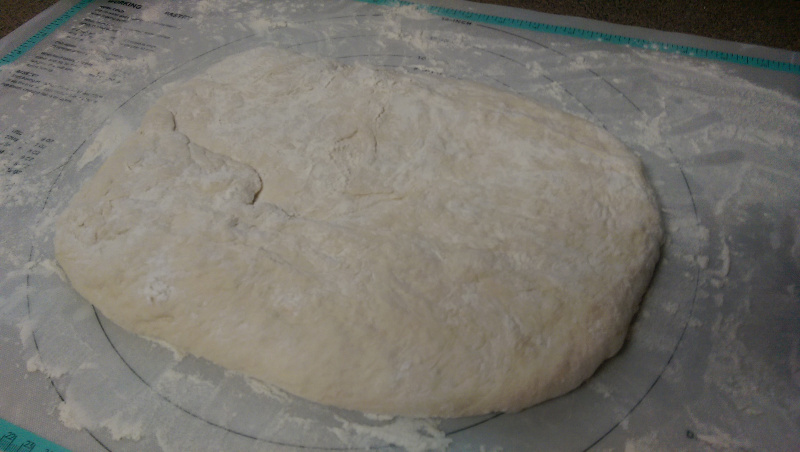 We will be using a no kneading method so leaving the dough alone is an important step. I will usually let it sit for a few hours, punch it down, let it sit a few more hours, punch it down again and finally let it sit a few more hours to punch it down yet again. I then put a fresh piece of plastic wrap on top, and stick it in the fridge over night. During these rises, the dough is doing your work for you. 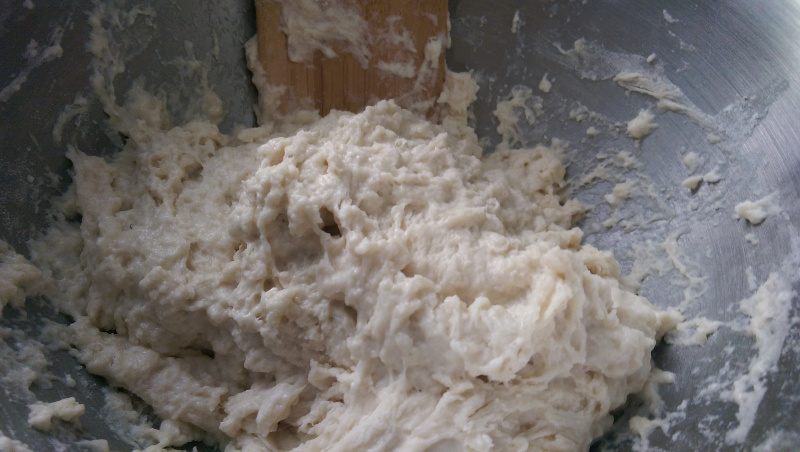 With a dough this wet, kneading would not just be a foolish attempt but frankly, impossible. I do realize this is a departure from an authentic, traditional recipe but in some cases that is alright despite my lecture. I have found this to not only be easier but also highly effective. Kneading simply builds gluten and we are simply doing that in a different, easier, less messy way. This is also why we are only using 1/2 of a tablespoon of yeast. If we used anymore by the end of the second rise the yeast may have already run out of food and the dough would bake dense and hard. We want airy, fluffy and light. Some people will tell you to poke a hole in the plastic wrap. Not me, the plastic wrap will stretch with the release of CO2 from the yeast and the low oxygen environment will keep your dough fresh. Yeast may like the oxygen but there is plenty locked in for them already. Don’t poke that hole! Just pretend your making beer. So that is it for today. You can leave the dough in the refrigerator for a few days if you like or get back to it the following morning with little difference in flavor, taste or texture. The cooler temperatures simply slow down the yeast enough that you won’t have to worry about them going hungry. Now, using the magic of the internet, I will travel into the future so we can contiue with this recipe. 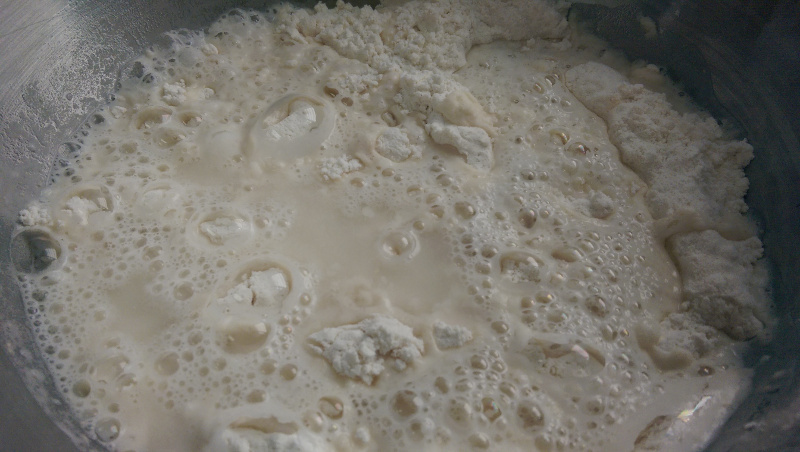 Hello, here we are, it is tomorrow (check your calendar) and our sloppy mess of a dough has now turned into this beautiful living mass of drunk yeast below. Place your pizza stone into the oven and preheat it to 450F. 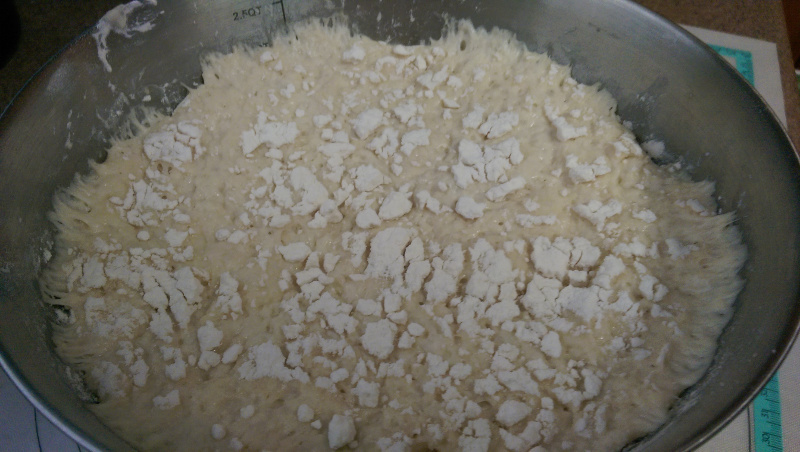 Nothing is more beautiful to me than this gorgeous mass of drunk yeast. You don’t have to worry about letting the dough warm up at all. Actually, it is best if you don’t. What we have here is a sticky wet dough that if we let warm back up will almost be impossible to work with. 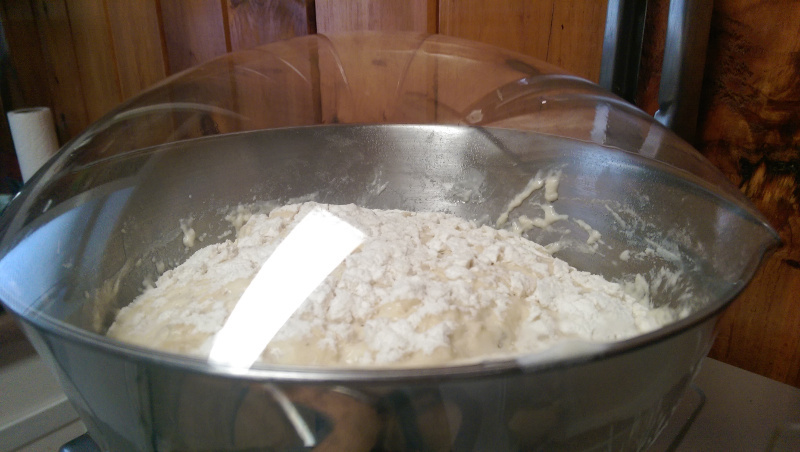 At the low temperature I find the dough much, much easier to deal with. So go ahead and dump your dough out on to a heavily floured surface. Flatten it out and shape it into a nice rectangle. punch the gas out and spread out into an even rectangle like shown here. From here, you want to slice it into 8 even strips going top to bottom (not left to right). These will be your 8 bagels. Take each strip, one at a time and drop them into some flour. The flour will help you form the bagel. Our dough is so sticky, don’t forget this step or you could end up leaving half of the dough on the surface. 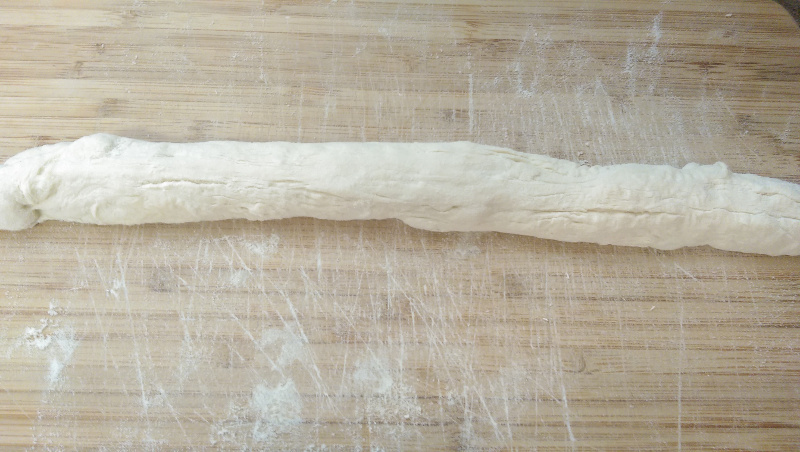 Now take a strip and gently roll it with your hands until it is about 12 inches long. Once you have it rolled to length, coil it into a circle like below. This is how you coil up your bagel. No poop jokes. Now this is the most important step when hand rolling bagels. If you don’t get this right, the bagel will break apart during the boil, leaving you with a tasty yet visually unappealing almost bagel. You want to take your index and middle finger and stick them inside the bagel hole. 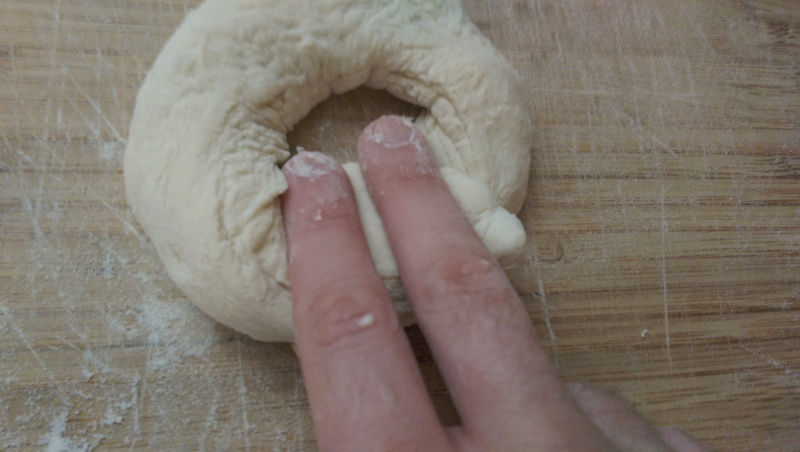 With your non-dominate hand, lift the top of the bagel so it is vertical then press firmly with your index and middle finger while rolling the dough. You want to connect the two ends permanently and seamlessly while keeping the bagels thickness as even as you can. I should get an assistant to take the photos, this was the best I could do with only two hands. With the outside nice and floured, the inside retains the dough’s sticky nature, easily forming together into a circle. 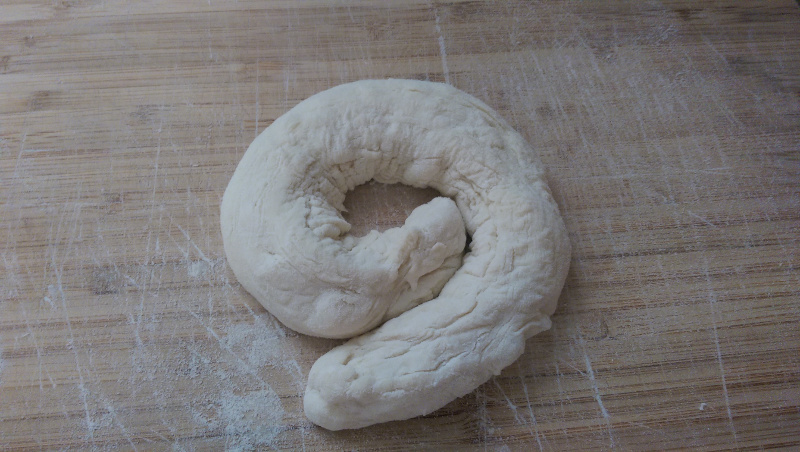 After the bagel is formed, drop it in some flour once again and set aside. Repeat this process for each of the 8 strips of dough. If you find rolling by hand too hard, make a ball then just poke a hole in the middle. 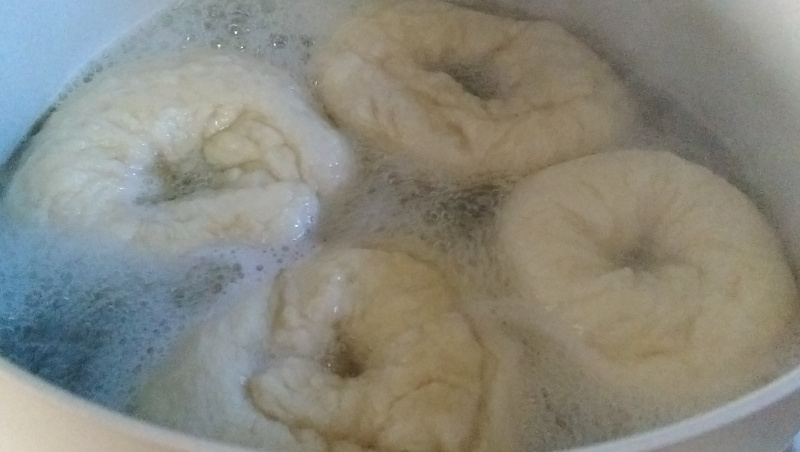 Once you have all of your bagels formed, get your large pot and fill it 2/3 of the way with water. Set it on the burner and bring to a rolling heavy boil. Once the water is boiling, drop your bagels right in. Depending on the size of your pot you can boil them all at once or do a portion at a time. Also, if you would like to be efficient, you could get the water going before you form the bagels so that by the time you are done, the water is ready. The bagels may sink initially so have a utensil ready to lift them off the bottom just in case they sink and stick a bit. Your bagels will grow while they boil making an additional proofing unnecessary. Opinions vary on boil time, but I have found it unnecessary to boil for more than a minute on each side. The longer the boil the more crispy the outside crust will be when cooked but if boiled too long the insides could become a bit water logged and a little too doughy after being baked. Bagels are usually cooked in the 500’s(F) and boiled longer but the home oven rarely goes over 450 so it can’t properly cook a longer boiled bagel. No matter, these will be crispy without the long boil and oh so fluffy inside. Using a spatula (or whatever else you got) take the bagels out and place on a heat resistant surface. 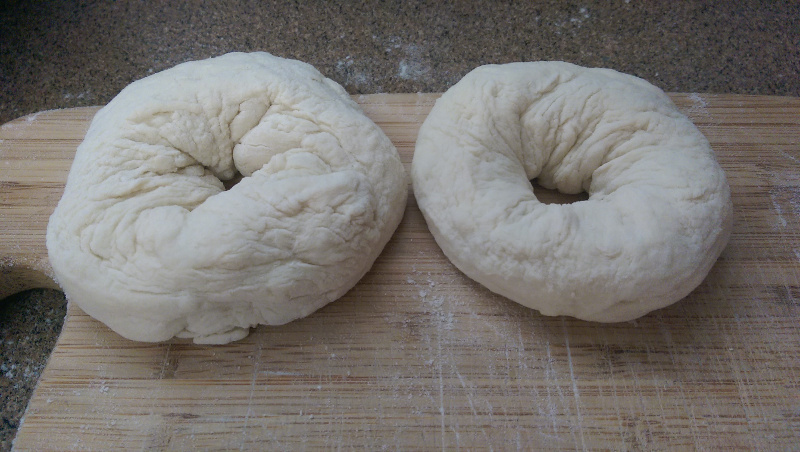 At this point, anything you would like to coat the bagels in (garlic, salt, sesame, poppy, etc…) will be going on. You can just shake it right on top or if your a bit OCD like me, coat your pizza stone with the topping so that the bottom gets some too (bottoming?). Spread a little bit of cornmeal onto your preheated pizza stone and then simply place each bagel on the stone. Depending on your boil and how crunchy you like your bagels, bake anywhere from 15 to 30 minutes. The bagels are ready once the outside has browned. Take them off the pizza stone and allow to cool for at least 10 minutes. This isn’t for safety, rather the inside of the bagel is still cooking and if sliced too early the bagel will be far too doughy for enjoyment. Any bagels you don’t eat fresh can be sliced then frozen for later. Hope this recipe works out well for you. If you run into any problems, drop me a comment below and I will do whatever I can to help out. My mouth is watering with anticipation. I hope yours turn out just as well. Did you give this recipe a try? Let me know how things went below.